Earlier in 2007, tech.co.uk brought you news of Sennheiser's all-new flagship noise-cancelling headphones, the £300 PXC 450. Just in time for Christmas, the company has launched a more affordable model at £230, the PXC 350. 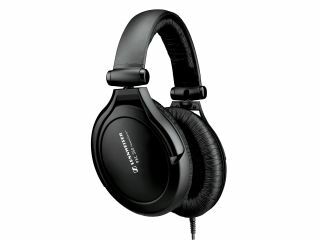 The new cans are Sennheiser's second full size round-the-ear headphones to join the five-strong noise-cancelling range. All use Sennheiser's proprietary 'NoiseGard' 2.0 electronics, which are said to remove up to 85% of ambient noise. In addition to the electronic noise reduction (which relies on battery power) there is also passive noise-reduction, achieved by the closed-back design. The NoiseGard system extracts the drone and excessive noise produced by cars, trains and planes, for example. The passive noise-reduction (from the closed-back design) tackles voice and more general noise. Just like its bigger brother, the PXC 350 also eliminates noise leakage - so fellow travellers won't have to suffer through the listener's music choice. Sennheiser points out that the headphones are, in fact, a serious hi-fi product and can be used at home with hi-fi systems, without using the NoiseGard system. With the electronics on, however, users can expect up to 40 hours use from a single AAA battery.